Sierra Leone has condemned Australia's decision to suspend entry visas for people from Ebola-affected countries in West Africa as "counterproductive" and "discriminatory". The move has also been criticised by Amnesty International. And UN Secretary General Ban Ki-moon has said travel restrictions will severely curtail efforts to beat Ebola. Media captionImmigration Minister Scott Morrison: "These measures include temporarily suspending our immigration programme... from EBV affected countries"
Nearly 5,000 people have died from the virus, the vast majority of them in Sierra Leone, Liberia and Guinea. The Australian government announced on Monday that it was cancelling non-permanent or temporary visas held by people from the affected countries who were not yet travelling, and that new visa applications would not be processed. Media captionUS President Obama: "We don't want to discourage our healthcare workers from going to the frontlines"
Permanent visa holders yet to arrive in Australia must undergo a 21-day quarantine process before departure. Immigration Minister Scott Morrison told parliament: "The government's systems and processes are working to protect Australians." But Sierra Leone's Information Minister Alpha Kanu described the move as "too draconian", insisting that measures put in place at Sierra Leone's Freetown airport had successfully prevented anyone flying out of the country with Ebola. "It is discriminatory in that... it is not [going] after Ebola but rather it is... [going] against the 24 million citizens of Sierra Leone, Liberia and Guinea. Certainly, it is not the right way to go," he told Reuters news agency. "This measure by the Australian government is absolutely counterproductive." Ugandan government spokesman Ofwono Opondo said: "Western countries are creating mass panic which is unhelpful in containing a contagious disease like Ebola. "If they create mass panic... this fear will eventually spread beyond ordinary people to health workers or people who transport the sick and then what will happen? Entire populations will be wiped out." Amnesty International said Australia was taking a "narrow approach". A spokesman for the human rights group said the ban made no sense from a health perspective but ensured that vulnerable people were trapped in a crisis area. Meanwhile, the president of the World Bank has appealed for thousands of medical workers to volunteer and help contain the growing Ebola outbreak in West Africa. Jim Yong Kim said at least 5,000 medics and support staff were needed to beat the disease. Mr Kim was speaking during a visit to Ethiopia, where he accompanied the UN secretary general and African Union chairwoman Nkosazana Dlamini-Zuma. "Right now, I'm very much worried about where we will find those healthcare workers," he said. "With the fear factor going out of control in so many places, I hope healthcare professionals will understand that when they took their oath to become a healthcare worker it was precisely for moments like this," he added. Mr Ban said that transmission rates in West Africa continued to outstrip the pace of the international response. On Tuesday, Mr Obama backed updated guidelines issued the day before for people returning from West Africa to the US. He said he did not want strict US quarantine policies to discourage "heroic" American healthcare workers from dealing with the virus at source. "America is not defined by fear, it's defined by possibility," he said. 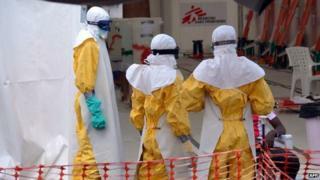 There have been 4,922 deaths from the Ebola virus, according to the World Health Organization's latest figures. The virus spreads through close contact and health officials say stopping the spread of the disease in the areas hardest hit by the outbreak will prevent Ebola's spread to other countries. Is it worth screening at airports? Video In 60 seconds: What is Ebola?